The celery cup no. 1 is a refreshing interpretation of the Pimm's Cup, a popular spiked lemonade drink from the United Kingdom. 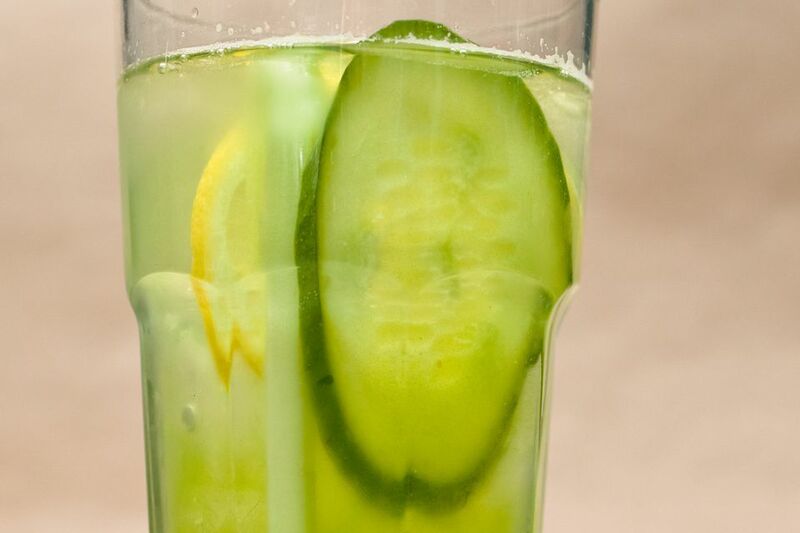 This recipe was created by H. Joseph Ehrmann of Elixir Saloon in San Fransisco for Square One and it features their amazing organic cucumber vodka. In the cocktail, the vodka and Pimm's Cup No. 1 (a gin-based liqueur) are paired with cilantro, celery, and English cucumber. The result is a tantalizing summer concoction with all the freshness you could want. In a mixing glass, muddle the cucumber, celery, cilantro, and lemon juice into a pulp. Add the Pimm’s, vodka, and agave nectar. Cover in ice and shake hard for 10 seconds. Strain into a tall glass over fresh ice and garnish with a piece of celery. In keeping with Square One's organic roots, it would be best to choose organic vegetables and herbs for the ultimate "green" cocktail. Choose pieces of celery that are closer to the heart because it is sweeter and better for cocktails like this. For cocktails, the English cucumber is always a good choice. This variety has smaller seeds and that reduces the bitterness, leading to a sweeter cucumber flavor. With all these fresh ingredients, it's definitely recommended to use fresh-squeezed lemon juice. You can typically expect to get 1 3/4 ounces of juice from the average lemon, which is more than enough for one drink. Not everyone is a fan of cilantro, though it really does give the drink a nice kick. Add a little less if you prefer. In keeping with the Pimm's Cup, you could top this drink off with lemonade (the original recipe); freshly squeezed is best. Try it with lemonade and club soda, which is a popular variation. Ginger ale is a common substitute, creating a Pimm's Rangoon, and Champagne is a good option for a version called the Pimm's Royal. This cocktail would be an excellent use for homemade cucumber vodka. The infusion should take about three days to reach its peak flavor. You'll want to remove the cucumber's skin and English cucumber is your best option. How Strong Is a Celery Cup No. 1? Estimating the alcohol content of this cocktail requires concentrating on the liquid ingredients. While the muddle will add to the volume, it's difficult to say exactly what that will yield and it will vary. With that in mind, the celery cup should weigh in just shy of 17 percent ABV (34 proof) when mixed according to the recipe. That's perfectly normal for a tall drink.